The Church of St. Alphonsus Liguori (Chiesa di Sant’Alfonso di Liguori all’Esquilino in Italian) is a church located on the Via Merulana on the Esquiline Hill of Rome, Italy. It is dedicated to St. Alphonsus Liguori, the founder of the Congregation of the Most Holy Redeemer, who built and staff the church. The church is one of the rare examples of neo-Gothic architecture in Rome. 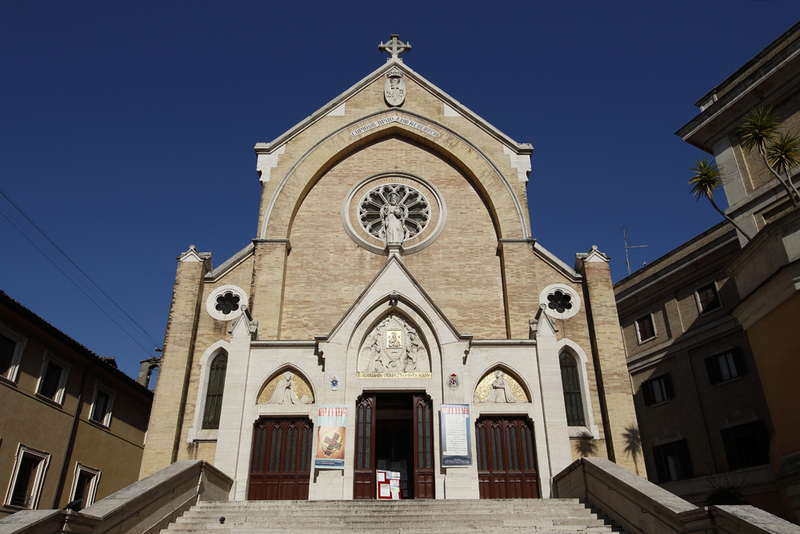 It is one of the last papal churches of Rome, although the Redemptorists have possession of the church and its related complex. It was built between 1855 and 1859, designed by the Scottish architect George Wigley. The facade is of brick and travertine and features three doors. In the central tympanum of the door there is a polychrome mosaic depicting Our Lady of Perpetual Help. The facade is further embellished by a rose window. The interior decorations, rich with marble, date from the end of the nineteenth century, and are by the Bavarian painter and Redemptorist Max Schmalzl (1850-1930). The apse is crowned by a mosaic, put in place in 1964, depicting the Redeemer enthroned between the Virgin Mary and St. Joseph. Below the mosaic hangs the original icon of Our Lady of Perpetual Help, which was produced in Crete in the 14th century and given to the Redemptorists by Pope Pius IX in 1866.